Buy a Hot Tub North Charlotte: What's the Difference Between a Spa, Hot Tub, and Jacuzzi? 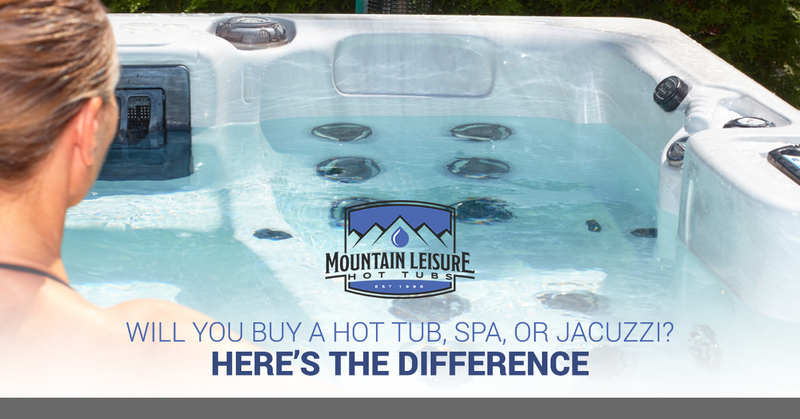 We know that there’s some confusion when it comes to the products we sell here at Mountain Leisure Hot Tubs. After all, our name has hot tubs in it, but we used to be called On Call Spa Services. Did we change our services from spa maintenance to hot tub maintenance? On top of that, when you take a look at the products we offer, all three of the hot tub companies we carry are called spas: Viking Spas, Hawaiian Breeze Spas, and Dynasty Spas. But many people find us by searching for “hot tubs near me.” Finally, where do Jacuzzis come in, anyway?! We know it can be confusing, and that’s why we’re here talking about the differences and similarities between hot tubs, spas, and Jacuzzis. Spoiler alert: In popular parlance, they’re pretty much the same thing! The earliest use of the term spa was to describe a naturally occurring hot spring that people sit in to relax. In fact, for most of human history, there have been reports of mineral springs with claims of rejuvenating properties. The word came from the town of Spa, Belgium, which had several natural mineral springs. As you can probably guess, we do not sell natural geological features that can be installed on your deck! If you’re watching a television show about upper-class people in New York City heading to the spa, it’s not likely that they’re heading to a mineral hot spring! No, they’re going to a day spa, and they might not even get wet while they’re there, let along sit in actual mineral water. Instead, they will most likely get massages and pedicure. Probably a sea salt scrub or whatever. But day spas are certainly not what we’re offering here at our hot tub company. These are the types of spas we carry at our hot tub company. Our spas are jetted tubs that are usually outdoors, used mostly for relaxation. Spas are almost always heated in order to soothe the body. Spas can be enjoyed by just the homeowner and their family, but they’re often used in a social way as well when you invite friends over. When most people think of a hot tub, they all have the same idea in mind. But because it has the word tub in it, some people can get it confused with a jetted, indoor bathtub (which it is not). Let’s take a look at what a hot tub can be. While the earliest spas got their heat from natural geological features, the earliest hot tubs got their warmth by placing heating stones in a naturally occurring depression and filled with water. You can probably see the problem with this. Heating and moving the stones would be a difficult task, and then you had to avoid the piping hot stone while you were in with it. It would have also been difficult to keep the temperature warm for long, and afterward you would have to remove the stones for the next use. Hot tubs started showing up in the United States around 1940, and they were social, hot-water tubs that were warmed by electricity. (They were not yet jetted, though. See Jacuzzi below.) These hot tubs were inspired by Japanese furo, also known as ofuros. While furos were usually just meant for one person, they were (and still are) a means of ritual bathing with the primary goal being relaxation. Furos were not meant as a means of cleaning the body, as a person would have a cleansing bath before using the heated furo. You’ll notice that we re-used that same heading from spa above, because hot tubs and spas or today are pretty much the same thing. If you contact our hot tub company asking for a hot tub or spa, you’re asking for the same thing. Why is Jacuzzi synonymous with modern hot tubs? The Jacuzzi company was the first company to add hydrotherapy pumps, so the moving water in a hot tub linked the word Jacuzzi in many people’s minds. What Do We Sell, Anyway? Whether you come to our company asking for a spa or a hot tub, we know exactly what you’re asking for. And if you ask for a Jacuzzi, we’ll roll with it! Give us a call to learn more about our used and new hot tubs today!